LOS ANGELES(AFP) - Harper Lee, one of America's most celebrated novelists who died in February, thought Donald Trump’s infamous Taj Mahal casino was hell on Earth, a stash of her private correspondence revealed Monday. The “To Kill a Mockingbird” author, whose masterpiece about racial injustice was read by millions, slammed the billionaire presidential hopeful's boardwalk resort in New Jersey in a letter to a friend in 1990. 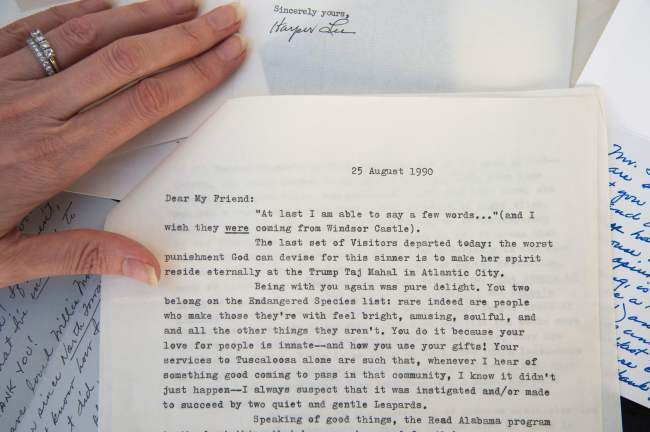 “The worst punishment God can devise for this sinner is to make her spirit reside eternally at the Trump Taj Mahal in Atlantic City,” Lee wrote in the missive, recovered along with several others from her New York apartment. Lee, who was apparently entertaining visitors, stayed at the $1 billion gambling spot a few months after its April 1990 inauguration. The resort is now owned by billionaire Carl Icahn, who took over in February after Trump Entertainment Resorts came out of bankruptcy, though it still bears the Republican frontrunner’s name. The note, written to her friend Doris Leapard in Tuscaloosa, Alabama, is one of 29 going under the hammer at the Nate D. Sanders auction house Los Angeles on Wednesday, and had already attracted an online bid of $1,209 shortly after being offered online. Most of the letters are typed correspondence between Lee and Leapard, and Leapard's husband, Bill, and all have a starting price of $750. In another letter to Leapard, dated January 29, 1999, Lee thanks her friend for getting her the autograph of Vivian Malone Jones, who in 1965 became the first black graduate from the University of Alabama. “I shall treasure (the autograph) always. Looking back, it’s incredible what people had to endure just for their basic rights,” she wrote. In another letter to the Leapards, dated January 1993, Lee complains about fans invading her privacy in her home town of Monroeville. “There has evolved a new holiday sport in Monroeville, that of people bringing their visiting relatives to look at me,” she wrote. The reclusive writer also corresponded with Mobile, Alabama resident Don Salter, an admirer who wrote to Lee after reading “To Kill A Mockingbird,” sparking a friendship that lasted nearly four decades. Lee died aged 89, having shunned the spotlight and spent her final years living in seclusion in Monroeville, where she was born. “To Kill a Mockingbird” is considered one of the great classics of 20th century American literature, and is standard reading in classrooms across the world. Published in 1960 and drawn from Lee's own experiences as a child, it came to define racial injustice in the Depression-era South. The novel sold 30 million copies and earned huge critical acclaim, winning Lee a Pulitzer prize in 1961 and thrusting her into an avalanche of publicity. Her fame was sealed when the novel was adapted into a Hollywood film that won three Academy Awards in 1963, including an Oscar for Gregory Peck for his portrayal of courageous lawyer Atticus Finch.